We're at home again. Thank you all for a nice weekend in Jönköping! As we pulled out from the show we managed to shoot some pictures of our land speed racer as it was shining like sliver in cold spring sun. Soon back in workshop were it will be safe...for a little while. Thanks for all stories! We're back tomorrow at the Bilsport and Custom Show! Creative car guys are good storytellers. Here my theory; They've done things. Good or bad, but they've done it. -...we were running 500hp in our Volvo 740...with a standard Volvo rear-end, but that never caused us any problems as I remember....we blow up four M90 manual transmission a week these days, but that was not really big deal, there more of them in the junkyard....but no real problem with the rear end ever...as I remember...hmm...well...now when I think about it...the rear end actually failed ones, when I was hunted by four police cars...after as it happened, I was drifting in a empty roundabout... and then...really embarrassing...the rear end broke down. The cops were all really upset, but I was thinking about my rear end failure. - Well, nevertheless, 3 months later I got my drivers licens back and I've managed to design a better rear-end.... so, again, are you sure about your rear end and its capacity? Disclaimer: Salt Slush does not encourage illegal driving. Car guys looking at land speed race engine. Anders and a golden seat in the sun. Live at the Bilsport Performance Show! As I slowly woke up this morning, still tired after a heavy sleep, I all of a sudden felt wide a wake! Why? Well, we were about to hit the road early on, when the bird was still singing in the rain. And even though I hate early mornings, I love to meet people who have dreams and schemes. Besides, we're always proud to present the progress of land speed racer and all cool stuff that Salt Slush Racing can offer. 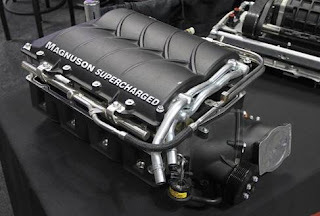 Which means high level stuff like; Magnuson Superchargers & Borg Warner EFR and AirWerks turbochargers. Our land speed racer at the Bilsport Perofmance Show! The proud crew before it all started together with some cool stuff which makes hearts and engines beat harder. We discussed a million dreams today and proposed enablers! We're already looking forward to tomorrow and the next show day! Well, not to tomorrow morning...any how.. Proud, Prepared and Powered up for a Speedy Eastern! At this time of year, people relax in the spring sun, sleep, eat egg and lamb and enjoy life...which means...being bored. But, luckily there's at least one alternative way to spend Eastern in Sweden. Go to Bilsport Motor Show in Sweden and talk about engines, Turbos and Superchargers with Salt Slush Racing. Energizing and exiting and relaxing at the same time in some strange way. Yes, we will bring our Land Speed racer and yes, we have moved forward since you saw it last time. We're literally tooling our way bolt by bolt to the Bonneville Salt Flats and soon we'll be there. Fore sure. Salt Slush team with favorite pet in dark garage. OK it's assembled, but how did we get it all together? ...before the creative assembly continued. And now it done. Is it? Well.., almost. By the way, I wonder if we can close the hood ? Never mind, charge air pipes are important stuff. 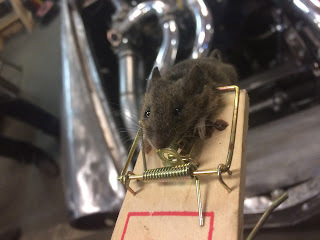 We have lately noticed new hang around in the garage that we don't wan't to become a team member. He (She) was noticed yesterday under the old milling machine running for protection. Immediately different tactics where discussed, …. all ending up with that we choose a conventional mouse trap spiced up with Kladdkaka (Creamy Chocolate Cake). The collected experience summed up in that Cheese does not work, Smoked sausage is rather Ok, but nothing beats Chocolate cake. There isn't a single mouse that can't be fooled with that. Chocolate cake is not the most healthy alternative. Just checking any rats in the Piano ? No everything OK ! In the Pick Up ? Yes but this is a good Rat ! A 454 !!!! Curiosity killed the cat! But not Salt Slush. We fell in love! It was a sunny, but cold, spring day in Gothenburg today, less than one week before the Bilsport Performance and Custom Show. The get-to-together event in Sweden for creative people with taste for style and speed. ...but instead Kalle and Anders got some exercise. Nerver mind why. To the point. Inspection, Inspection, Inspection. The Magnuson Supercharger Kit for Corvette LS3 is on display. A coffee table decor made in heaven. Anders and Magnus are looking at details. How about Kalle? What does he think? Never mind. He's in love. Enchantment broken. Back to the race Amazon, The show must go on. Anders & Angle grinder in Service. Why? A packaging conflict needed to be resolved. Kalle + Tiger Saw + Determination = Result! We're good! Ignition, Sequence...START!!!! Engine is running! A small step for mankind, but a gigantic leap for Salt Slush Racing was taken today 4pm when our race engine fired up ad sang its first song. When we past this milestone Salt Slush and Friends were more than happy!! The Salt Slush N3T based race engine first real start. But as always, there's a before and after.Before the engine started we double-checked everything twice, called in friends, and googled our way forward, but we just went deeper and deeper in to the well known Garage Depression. As a consequence, we started to protect our ears more carefully. Then Per showed up with his expensive (now justified!) 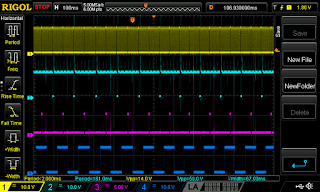 digital oscilloscope. Tada! We doublechecked the crank sensor tree times and Yes, we found the problem! For those who don't know...this is how it feels when the Garage Depression, suddenly goes away. It coincidently happened when the combustion moved back in to the engine. Anders, Ragnar, Magnus and Leif, all happy as kids on Christmas Eve. Cina, here dressed in her Sunday best, also cheered up significantly! Computer Geek Equipment Disguise revealed. The oscilloscope's home; A bag from Marimekko...By the way, this picture of P.A was taken after the engine started. And, if you wonder, what was the issue? And, what was the solution? The symptoms we have had the whole week was that it started nicely while in "crank mode". It reved up and ran sporadically for at most a few seconds. Until... when we hooked up an oscilloscope to the cam, crank, injector and spark signal. Then the problem appeared in daylight. With the scope we could see that ignition timing was good until the engined got some rev. Then the ECU lost its concept, and started to fire seemingly at random. This picture is after the cure and is what it should look like. We have crank signal, 60-2, in yellow on top. 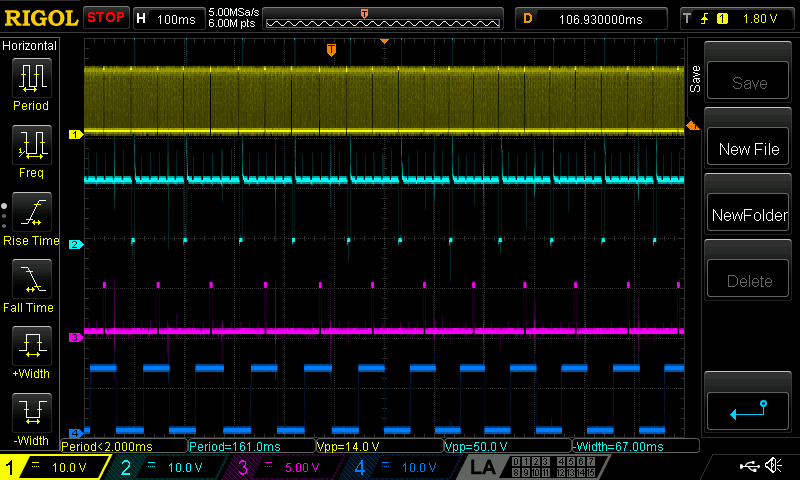 Cam signal on bottom in blue, spark in purple and injector as light blue. All in harmony. When it failed spark got out of sync with cam, and crank. The source of the problem and the solution? We switched it to a hall sensor. And on the very first try it just fired op and ran perfectly on lambda 1. Power to the People! Increase the boost....and your mind will follow! Is it a Swedish family name? Is it a furniture from IKEA? No, No...it's a Supercharger Kit from the US of A . Something that will make your Camaro, Corvette or C63 Mercedes engine pound like hammer, your senses go wide awake and the hair on your arm stand up. 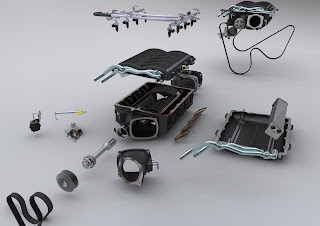 Exploded view of The Piece of art. Weekend Word of Wisdom: 400hp is ok. But additional 200 to 400hp makes a difference. 600 to 800hp is better than 400hp. Oops we did it again…..
As a natural step in the debugging process, leakages has to be found and handled. So what do you do ? Full speed ahead! Fill up the tanks, water and gas! Background: The big buffer tank for engine cooling still sits outside the car, but connected with nice swimming pool hoses. Fuel system is connected but not yet tested. So again, here we go...what could possibly go wrong. Gas system fully set up and ready to run, just fill up the tank and be happy. What do you do ? Stop the flow in a very simple but proven way, with a finger. Here's Anders when stopping the gas from ending up at the floor! Water tank all filled up and ready! What happens ? Yes, You guessed it! Has to happen..
Luckily, there's more fingers available. Here's Ragnar when stopping the water from ending up at the floor. Both Anders and Ragnar are very experienced, sophisticated and well educated, but still prepared to come to use in such a down to earth situation (dirt) in a very pragmatic way. Håkan appreciating the all good help which stops the garage flooding. he and Cina went of to the city dump to relax. Back in the warm and cosy garage in to the set up of the Holley EFI system. Furious Fueling on Sparkling Saturday! It's time for the amazing Gasoline, the ultimate Energy Drink, to arrive on the scene. Ready to burn in a furious flames. All hands are brazing on. Thunder and lightning lined up. ...then, 10 minutes later...actively engaged. Why? Speed and Power get's you going. Can we stand the heat and the pressure? Don't know, but we will measure. The old milling machine did what it was supposed to do and now the MAP sensor is integrated. Do we have the spark? That's what we needed to find out. And yes, we've got it. But how cool are we? Good question. At least we have one hell of a cooling tank. Johan is trying to grasp the size. It's coming to him. He will understand. Meanwhile, in another part of the workshop, Tapio, the blacksmith to be, is forming steel leaf from chunks of metal. All good and now it's Sunday.